The Galway International Arts Festival is Ireland’s largest international arts festival. Founded in 1978 it has grown into an event with a significant reputation where, in recent years, there were 162,000 attendances at 176 performances, talks and exhibitions in 27 venues over 14 days. The Festival showcases a wide variety of international artists alongside the best of Irish talent and includes music (popular, contemporary, jazz, world, classical and traditional), theatre (indoor and outdoor), visual arts, dance, talks, discussions, family events and comedy in its programme. Highlights from the programme in recent years included, Primal Scream, Philip Glass, New York Dolls, David Gray, David Byrne, Brad Mehldau, Blondie, Kronos Quartet, Brodsky Quartet, Bon Iver David Hockney, Joni Mitchell, Henri Matisse amongst others. Visiting international theatre and dance companies have included John Mahoney and Northlight Theatre, The Royal National Theatre, Propeller, The Royal Court, Steppenwolf, Michael Clark Dance Company, Hofesh Shechter Dance Company, The Abbey Theatre, Druid Theatre Company and the Bristol Old Vic. 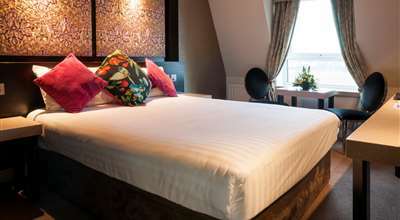 Flannery’s Hotel offers great value for anyone visiting Galway during the Arts Festival. BOOK NOW for the ideal Galway International Arts Festival Accommodation.